The Charities supported by the Barton Family Festival in 2018 are listed below. £4,500 was raised for these good causes. Thomas Russell Infants’ School, in its present building, has been at the heart of the community of Barton under Needwood for over a hundred years and prides itself on having close links with local organisations such as St James’ Church. The school enjoys being part of the ongoing story of the village, with children following in the footsteps of parents and grandparents who attended the school. It is always looking for ways to create an even better learning and playing environment for pupils. 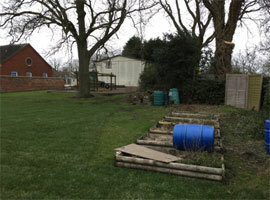 The recent addition of a new classroom has created an an opportunity to extend the children's outdoor opportunities with plans for a garden project to enhance the area around it. With school budgets being squeezed the school is relying on fundraising to provide items such as picnic benches, bird feeding stations, insect houses and flower/vegetable beds. The festival aims to help the PTA fulfil the project by providing one of the benches. The SFCA is a not for profit association run by the Staffordshire Foster Carers Association or SFCA to support Foster Carers and their foster children. The group receives no funding from Staffordshire County Council and raises funds in its own right to support projects and events organised by the SFCA. The aim of the association is to improve the lives and outcomes of foster children and enable them to lead as normal a life as possible. The group, which is run by a dedicated number of Staffordshire carers, continues to support these projects and events while also increasing funds to a sufficient level to enable it to become a registered charity. For 486 years, the church has stood in the heart of the village. It is open to everyone, every day, for people of all ages to rest, reflect and pray. It too will be supported. £1,500 donated to St James Church after the 2017 event.